I was wondering people's opinion on getting the 64gb model vs the 32gb. Seems like a good deal but since the phone has expandable storage, I'm not sure it's necessary to pay the extra $50. Do you have lots of apps? Or other stuff that needs to go on internal? Personally I use the sd card for media. Anything non personal. So for me, 32gb internal would be enough. And for $40 you can pick up a 128gb microSD card. I agree with you. For me 32gb is just enough, even without the SD card. I hear that the Honor 8 supports adoptable storage (haven't tried it, not sure if it works yet) so what's the point of that extra $50. At least to me anyway. You do have a great point. I'm personally not a fan of it. It's nice but such a hassle. 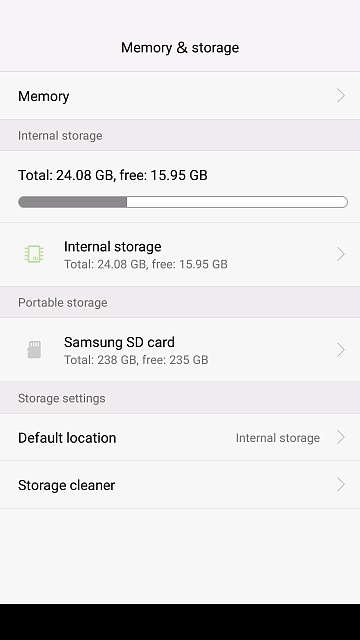 I used adaptable storage on my moto x pure. I twice lost all my apps when the phone refused to recognize them on the card. I also had some app incompatibilities. If google continues to support the feature we may see improved performance over time. To me it makes sense on 4gb or 8gb phones, maybe 16gb. AND only if you can't afford more internal storage. I mean... If you only have $50 to spend then your choices are limited. If you are paying $400 AND there's a 64gb option for $50 more... Then get the 64gb. Or downgrade to the Moto g4 plus 64gb model... Personally I would take a slightly lower specd phone but not have to deal with adoptable storage. I have a ton of pictures, but I guess I can just google photos. I would recommend g-photos regardless. On a hiking trip once I slid down a small waterfall accidently and I dunked my phone. The device would turn on but the screen was unreadable. My photos still backed up when I got in wifi range and I saved some really memorable photos. Is Honor 8 a better value than iPhone 7?